Legio Minimus: Dark Eldar Tactica: Kabalite Warriors! Alrighty, time to delve back into some good old fashioned 40k tactica articles. 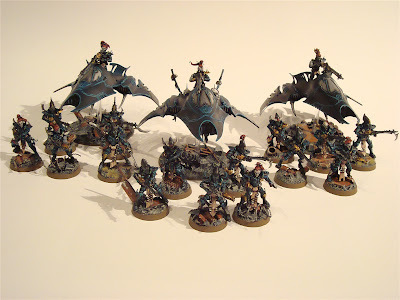 It has been a while since I wrote my Tyranid articles and have since then shelved that army (until a new codex comes out) in favor of the Dark Eldar. I can honestly say I have never had this much fun both painting and playing any army for 40k which is saying something since I have been playing for 20 years. I have held off starting this series of articles for quite a while (they came out almost a year ago) because there are so many viable options not just in unit choices, but the choices available within the units themselves. I had to do a lot of play testing to start getting the hang of how things work and I feel that I have still only just scratched the surface. The crazy thing is there is still so much of this book I haven’t even had a chance to use yet and I am still working out configurations for even just the basic units like Warriors and Wyches (which is what my first two articles will be about including their elite counter-parts). Writing Tactica articles for the Dark Eldar is such a different beast then the writing for the Tyranids. The Tyranid book all the choices are just so obvious as to what is useable and what is complete garbage (hint, most of the book lol). Virtually EVERYTHING in the DE codex is viable, yes, including Mandrakes (note: I am not endorsing Mandrakes, just saying they COULD be useful in the right circumstances). The Dark Eldar troop choices are really versatile and very fun to use. It is also nice having options with your HQ to alter the force organization chart to give you an even larger selection of troops you can use like the Haemonculus making Wracks troops or Baron Sarthonyx making Hellions troops. Whichever route you chose though the one constant thing I would like to stress with this army is taking at least 4 troops in your army (this is for 1500pts+). With the way 5th edition is set up 66% of the time you are playing objective based game and when your primary troops are Toughness 3 with a 5+ armor save being the best you can get, your troops can disappear very fast. In my 1700pts+ list I always run 6 troop choices and it has yet to fail me, even in kill point games as they are some of the better units in the Codex anyways. The first unit I want to talk about is the most iconic unit in the codex and that is Kabalite Warriors. The main strength of this unit lies in its versatility of shooting. They have great weapon options which includes their basic weapon, the splinter rifle, which shouldn’t be overlooked. There are just so many ways you can run these units and still be effective and I will do my best to give you guys some ideas on different builds you can try. 3rd Ed Throw Backs: Everyone and their dog used to run 100pts DE warrior squads that had 2 Dark Lances in them. Obviously you can’t do that anymore but what you can do is a Dark Lance and a Blaster which comes in at 130pts. This is actually a squad I use quite a bit, basically in every army. Its main purpose is to be my static home objective holder as well as some resilient anti tank (well…when compared to Raiders and Ravagers of course lol). Venom Spam: This is the most common build for Warriors. Virtually every Net List you will see spams these puppies. There is a reason for this as I have had nothing but success with them and I love running them (I normally opt for 3 in most lists). They are cheap, pack a huge amount of firepower for both anti infantry with some small amount anti tank. The basic set up is just 5 Warriors with a Blaster in a Venom that has 2 Splinter Cannons and that comes to 125pts. I find these guys are a great in a supporting role but not much else. Due to my play style I would never make them the sole focus of my troops as your Warriors and Wyches have so many important roles they can and should fill. Their real strength comes into play as a harassment unit, taking on longer range targets that need softening up near the beginning of the game specifically units like Devastors, Long Fangs and Lootas and to overload your enemies with target priority. Jack of All Trades: This unit would be 10 Warriors with a Splinter Cannon and a Blaster (or Shredder depending on your preference) in a Raider. It comes in at a cool 175 points (with a blaster) and offers some great anti troop shooting combined with some anti tank. The best way to think of it is it’s basically the first two options combined into one unit minus 1 splinter cannon. For their Raiders the 3 upgrades I would look into are Night Shields (I normally include these on all my Wyche Raiders as they are always moving flat out), Splinter Wracks and Flicker Fields (I would consider these for my Warrior Raiders as they will be more stationary). Doing that effectively turns the Raider into a really nice little gun boat. One thing to note is you do have to be very careful to not go overboard with the upgrades for your Transports as even just a couple of upgrades makes them very expensive for what they are (60 point Raiders die just as easily as 90+ point ones). Just make sure you really know what you want each squad doing and upgrade accordingly. The thing I like about this unit over the “Venom Spam” unit is it has the numbers to grab and hold forward objectives with the versatility to deal with most threats. Warrior Blob Squad: Typically there are two ways of running this squad, both of which are fairly similar. The first would be with 20 Warriors with 2 Splinter Cannons and a Sybarite with an Agonizer (or no Sybarite if you want to keep it cheap). I ran this squad almost exclusively for the first little while and the only time I ever lost it was when it was charged by a Death Company Dreadnought with Blood Talons (did 17 wounds on the turn it charged nothing I could do lol). The second way, which is the one I would do now that I have quite a few more games in with the army, is running that squad same as above but take out the Sybarite and add in Duke Slicus and a Haemonculus with a Liquifier. Now if you don’t move you have 30 shots at 24” or 48 shots at 12” that all hit AND wound on a 3+. You can put a significant number of wounds on anything with a toughness and you have a unit that is almost immune to standard shooting when in cover. Blaster Trueborn: Basically if you ever post a list for critique on any of the main forums the first comment you will see is “take whatever option you have and replace it with 4 Trueborn with Blasters in a Venom!”. It is obviously an effective unit that is perfectly geared towards a dual role on the battlefield. Once you start getting into larger games it is a great way to add some much needed Dark Light firepower into your army. An alternative way of running this tried and proven squad is 4 Blaster Trueborn and 2 Dark Lance Trueborn in a Raider. Doing this turns it into a very focused squad that gives you 7 Dark Light shots per turn. You are now effective at longer ranges as well as being mobile if need be as you can still move 6” and fire your 4 blasters and the hull mounted Dark Lance. If you want to go really crazy you could also add in an Archon with another blaster to bump your blaster shots up to 5 (so 8 Dark Light weapons). At this point it is getting very expensive and verging on overkill…although…in my opinion there just isn’t such a thing as overkill as I ALWAYS roll horribly for these weapons lol. Dakka Trueborn: I am referring to the Splinter Weapon based anti troop options for this squad. Your basic squad would be 3 Trueborn with 2 Splinter Cannons in a Venom. This unit costs 121pts gives you 20-24 shots a turn but evaporates in the blink of an eye to any enemy resistance. The variation that I have been trying out with much success is bumping that squad up just a bit and turning it into a 5 man squad with 2 Splinter Cannons and 3 Shard Carbines in a Venom with an extra splinter cannon for a possible 33 shots at 160pts. To me this is the sweet spot for this squad as the cost is still fairly cheap for their output and there are no wasted bodies in the unit plus it just looks awesome lol. The maxed out variation of this squad which I have been working towards is 9 Trueborn with 7 Shard Carbines and 2 Splinter Cannons with Duke Slicus in a Raider. Same amount of shots as the previous Trueborn Squad except you wound everything on a 3+ and actually have some staying power because your numbers are doubled. Template Trueborn: Another fun and very effective way to run some alternative Anti Troop if you really enjoy getting into people’s faces are having a 4 man Trueborn Squad all armed with Shredders in a Venom which comes out to 133pts. It gives you 4 x str 6 blast templates which can really put some hurt on units. You can also add in a Haemonculus with a liquifier for even more templatey goodness and additional staying power. Doing that though does up the price of the squad which almost defeats its purpose in a way which is having a cheap squad that can dish out a whole wack of wounds. Themed Trueborn: This last one totally goes against their primary role but I wanted to include it as something to think about if you ever plan on running a fully themed Kabalite Army and wanted some hand to hand combat Warriors. These guys can switch out their splinter rifles for close combat weapons and pistols for free. You can also include some Shredders to soften the enemy up before you charge. They also have the option of taking assault grenades and haywire grenades for 1 and 2 points respectively which is another nice bonus (something I wish Incubi had…sigh lol). Going with this set up gives each Warrior 4 attacks on the charge which is pretty decent and your Dracon will have 5 attacks on the charge with an Agonizer. 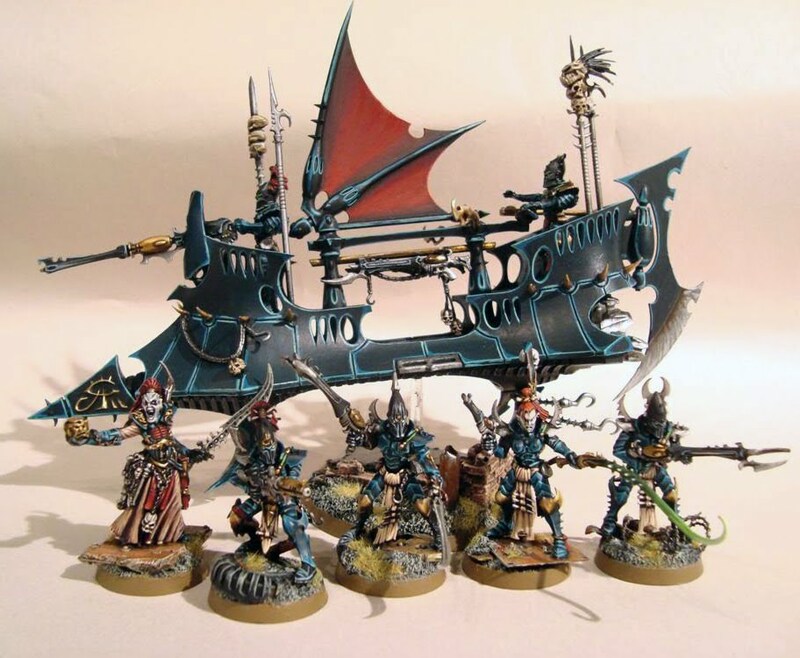 As I said before, definitely not the most competitive unit out there (as Wyches cost the same and are significantly better at this role) I just think it is really cool that Phil Kelly gave Dark Eldar the option to do this if you want to go for something fun and different. There are definitely more builds out there for these two core units. I just wanted to point out some examples of the ways you can run them (some competitive, some not as much). The next article in the series will be the Wyches and Bloodbrides which I am looking forward to as they just might be my favorite unit in the codex. If you guys have favorite builds of your own for Warriors and Trueborn that I didn’t list here I would love to hear them as I am always on the lookout for fun and different builds. As always thanks for reading! Nice to see you writing some tactica as well. Also looking forward to see more of your painted models.